Have you gone grocery shopping when you were hungry? Have you noticed that when you do that you really fill the shopping cart with everything that you see, whether you need it or not? That’s what happened (sometime back in December) and I had a tub of Old English style fruit and citrus peel mix sitting in one corner of the refrigerator until last week. 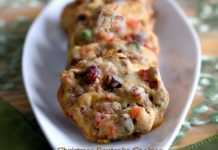 Finally, I decided to use it and the first recipe which came to my mind was the Vegan Christmas fruitcake. Earlier I had baked that cake using applesauce. Since this month’s egg substitute is yogurt and buttermilk, I decided to go with buttermilk. Moreover one of the visitors (Ramya) had mentioned that she tried the recipe with yogurt and it came out well and so did mine. It’s really amazing that a simple recipe like this and with NO added fat can yield such fabulous results. Everybody loved the bars. This time I have categorized it under bars because it can either be a cake or a bar. However you call it, the taste is phenomenal. I also replaced the all-purpose flour with whole wheat pastry flour that did not affect the taste as well. The only con I would say is the high fructose corn syrup in the fruit mix. As I have mentioned I bought it without looking the ingredients and had to use it up. Preheat the oven at 350F for 15 minutes. Grease and dust a 13×9 inch pan with little flour. In a large bowl whisk together whole wheat pastry flour, baking soda, baking powder, salt, ground ginger (if using) and light brown sugar. Also add the chopped dried fruits and nuts of your choice. Make sure that the dried fruits are not lumped together. Use your fingers mix it thoroughly. In a liquid measuring mug, measure 3/4th cup of buttermilk and vanilla extract; whisk it nicely. Add the wet ingredients to the dry ingredients and mix it well. Since it’s a lot of dried fruits and nuts, chances are the flour mixture in the bottom may not be combined well. Spread the batter into the prepared pan and use a spatula to evenly press it. I baked for 30 minutes first and then slowly increased the time and around 37th minute took the pan from the oven. Check the center of the cake with a toothpick to see if it’s done and time it accordingly because ovens may vary. Once out of the oven, leave the pan on a wire rack and let it cool completely before cutting it. Let it cool completely; don’t be in a hurry or else you will end up with broken pieces. Anyways the bars taste better the next day and gets even better later, so be patient. These bars will keep good for 2 weeks in room temperature and store for months in the refrigerator. 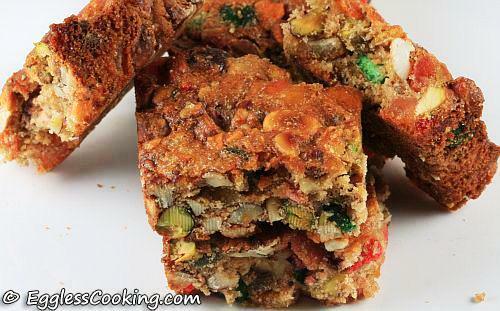 Any combination of nuts and dried fruits can be used in this fruitcake/bars. The only thing to be followed is that it should be 3 cups of nuts and 3 cups of dried fruits. This time I used one pound (16oz) box of Old English style fruit and citrus peel instead of dried fruits and a mixture of cashews, pistachios and hazelnuts. The fruit and citrus peel mix saves the time chopping dry fruits into small pieces and also the bars taste exactly like the fruitcake we get from stores. But I have to agree that it’s not as healthy as using actually dried fruits because the fruit is sweetened with high fructose corn syrup. I used it because I had bought that tub in a whim and had to use it. 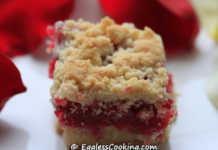 The original recipe uses 3/4th cup of brown sugar, but I used only 1/2 cup because the fruit mix is also sweetened. I used 1.5% fat buttermilk. The buttermilk which we get in the US is pretty thick, it’s more liked thinned yogurt. I did not dilute it with water because I did not want it to lose its acidity since we are replacing it for 3 eggs in the recipe. As soon as I removed the pan from the oven the cake looked pale/whitish on the top. I had done the toothpick test and it came out clean and that’s why I took out the pan. When I saw the cake I was worried maybe the buttermilk had curdled or something. But as it cooled, it looked very normal with a brown color. Also, the bar was a little hard on the day I baked. I thought I had baked too long. Again by the next day it had become soft and got only even better after that. I want to make them as muffins. Will it work ? How long would I need to bake them ? Can you give me a rough estimate ? What can i use instead of buttermilk for this recipe ? 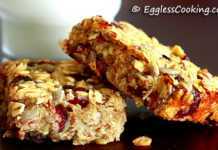 You can use unsweetened applesauce or yogurt. I tried this wonderful recipe of yours, and it turned out GREAT. I have decided not to use apricots next time, as they didn’t blend with other dried fruits. Thanks for the recipe. first of all thanks for the amazing recipes. Now my question is what kind of fruits you have used?I am sorry for asking such silly questions but I do not know much about baking so want to know what are the my options of fruits to be used? I used a candied peel mix, which is available during this season in the baking aisle. It’s a mix of pineapple, orange peel etc. Yesterday I tried these bars… Just sliced and they have come out sooo good. Have sent you a mail too.. The slices are a little soft, though its baked properly. Is that okay? Are they supposed to be hard? Thank you for such a wonderful healthy recipe. Thanks for detailed explanation MAdhu. I am making this cake today to take it to India on May1st.. I have made many other cookies from you website.. Whenevr i find time I will mail you from India to let you know the commenst of my family when they eat the cookies.. Thanks again. You’re most welcome Yojana. Have a safe and fun vacation. Thanks for your reply but my other question is still unanswered. I have comented twice in the same post.. Sorry for the trouble but please let me know about the flour and the pan I can use. NOt repeating the question as its laready there in the comment section. I remember it Yojana. I was answering the questions and got some other work. So I thought I will get back once I’m done with it. Let me answer it in that comment itself. I know that most of the cookies will stay good and do not need refrigeration.. But how about this cake , can I make it now and keep it in the refrigerator and pack them in a plastic box while travelling. Will it stay good ? and also about other cakes and muffins . Yojana, what you could do is bake it ahead. Cut them into bars and wrap them individually and freeze it in a zip loc bag. I want to bake this cake . I have all the ingrediends except WWPF. You have mentioned to one of your visitors that regular chapathi flour can be used and equal parts of APF and wheat floue can be used.. What should I use and also to let you know the chapati flour I use is whole wheat flour+bran. Another question is that I dont have a 13×9 inch pan. I have a 9″ square pan and a loaf pan of 9″ .. Which one would fit the amount of batter for this recipe ? Yojana, if you see the recipe it uses only 3/4th cup of flour and has a whole lot of dried fruits and nuts. So using whole wheat flour/chapathi flour should not distract the taste. Whole wheat pastry flour is milled from soft wheat as against hard wheat, so the texture is more fine than the regular whole wheat flour making it suitable for baked goods. So even though the whole wheat pastry flour has the bran and germ intact it is more subtle than regular wheat flour. So where I have used a considerable amount of whole wheat pastry flour (like 2-3 cups, in a cookie, muffin, cake recipe), I would suggest using a mix of regular whole wheat flour and all purpose flour. In this recipe you could simply use plain all purpose flour or a mix or whole wheat flour because it is just 3/4th of a cup. Regarding the size; you could use a 9×5 inch loaf pan. If you see the original recipe (http://joyofbaking.com/DriedFruitandNutLoaf.html), only a loaf pan is used. Make sure that you bake it for a longer time though. I think it is mentioned 60-75 minutes. I have not baked this in a loaf pan, so I do not know the exact time. It is also mentioned that this keeps well for 2 weeks at room temperature and for months in the refrigerator.